Pugs are the clowns of the canine world. These sturdy, compact dogs are full of personality and love to eat. Due to their affectionate nature, as a pet owner, I’m sure you want to provide the best dog food for your Pug. In this article, you will learn more about the characteristics of a Pug, feeding guidelines, health issues and our list of the top dog food for Pugs. * click on the product name and you can check the current price and read customer reviews on Amazon. If your interested in learning more about each product, you’ll find in-depth reviews of each of the best dog foods for Pugs that we recommend if you scroll towards the end of this article. This affectionate dog is considered a toy breed by the AKC due to their small size. They tend to be a passive dog, content to sit in your lap. Pugs enjoy companionship and will become your best friend. Generally, they are fond of children and other pets, and they aren’t afraid of strangers. Since they have moderate energy and are generally calm and quiet, they adapt well to apartment living. While they are not an overly yappy dog, they tend to wheeze and snore quite a bit. Expect to be sidetracked by some foolishness if your pug doesn’t get a brisk walk around the block. This exercise gives him the opportunity to investigate new sights and smells. If there are any drawbacks to owning a pug, some have a stubborn streak and can be somewhat hard to train. Also, they have a double fur coat. So even though they have short hair, they may shed a lot. What’s the Recommended Calorie Intake for my Pug? What is the Best Dog Food for my Pug? Pugs weigh about 14-18 pounds. According to Petpug.com, they should eat about 50 calories per pound which calculates to 700-900 calories. Pugs are not as active as some other breeds, so this is just a general guide. Monitor caloric intake compared to activity level to determine the best amount of dog food for your pug. Pug puppies need about an ounce of food for each pound of his weight. Adult Pugs should eat ½ ounce per pound of their weight. Also, reserve healthy snacks for obedience training. Pugs love to eat! If you combine overeating with their mild activity level, it makes them prone to obesity. Obesity causes many health issues for all dogs. For pugs, the extra weight puts too much pressure on their stout legs. Pugs need a diet that is rich in high-quality protein and carbohydrates from fruits and vegetables. Too much corn and grains may induce a pug’s potential joint problems. Some dog food manufacturers sell dog food brands that are high in protein and low in calories. These brands work well to help manage weight for less active dogs that tend to overeat. Look for dog foods that list a type of meat as the first ingredient and avoid dog foods that contain by-products and fillers. These are just empty calories with no nutritional value. Switch to adult dog food at 10-12 months of age. Pugs need ½ to 1 cup of high-quality dry food per day. Dogtime.com lists a variety of health problems that are common with Pugs. Skin Condition. Cheyletiella Dermatitis, or Walking Dandruff, looks like heavy dandruff. It’s really a skin condition caused by small mites. Chafing will typically appear down the Pug’s back. Cheyletiella Dermatitis is contagious, so when it surfaces, treat all household pets. Brain Disorder. Pug Dog Encephalitis, or PDE, is a brain disease that only affects Pug dogs. PDE causes the dog’s brain to become inflamed. It causes seizures and blindness, and it can be fatal. Seizures. Pugs are also prone to another condition that causes seizures called idiopathic epilepsy. There is no known cause of these seizures. If your pet is seizing, take him to the veterinarian immediately. Nerve Degeneration. Another serious problem that affects Pugs is nerve degeneration. This disease doesn’t seem to cause pain, but it causes lack of mobility in their rear legs and backside. This condition impedes jumping and running. Dry Eyes. Pugs have large, pronounced eyes. Eye injuries and corneal ulcers are common. Pugs are also plagued by dry eyes. Two conditions called keratoconjunctivitis sicca and pigmentary keratitis, are diseases that cause eye dryness. Both conditions are treatable, but not curable. Take a look at our in-depth reviews of dog food for a Pug. We reviewed several top-notch dog food brands for your special pup. 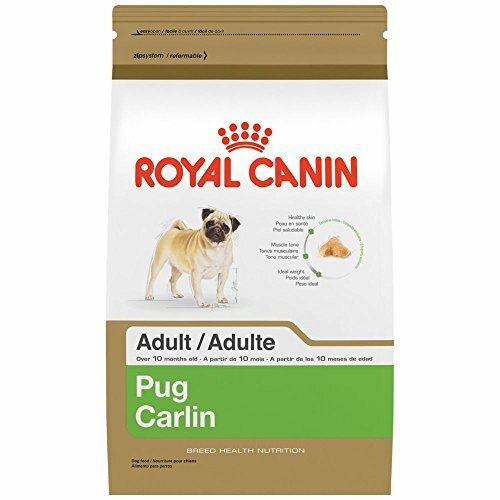 This dog food is formulated specifically for Pugs over ten months of age. Since the Pug has a short snout, the small cloverleaf-shaped kibble is easy for them to eat compared to some other brands. It is made with a high-protein chicken meal, brown rice, ground corn, oatmeal, and chicken fat. Pugs have unique folded skin, this recipe contains special nutrients to help maintain skin health. 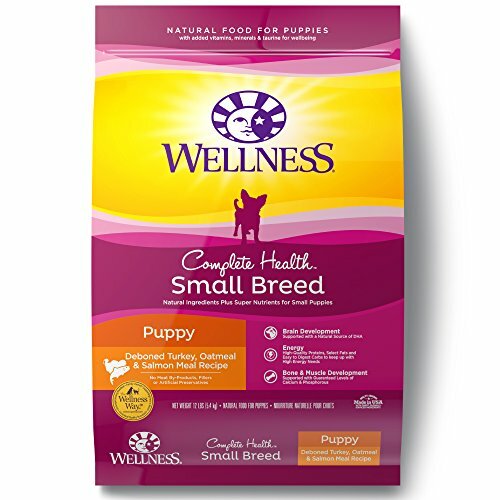 Wellness Complete Health Small Breed Puppy Recipe is formulated to promote the unique health needs of smaller puppies like the pug through whole foods. Made with nutritious turkey, oatmeal, and salmon, the smaller kibble size is perfect for pug puppies! 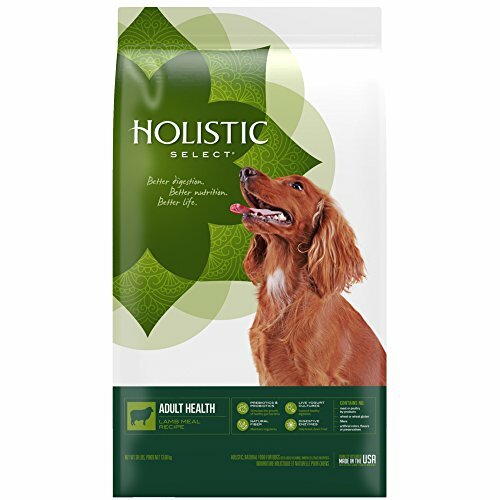 This formula contains an extra boost of glucosamine and Omega 3 fatty acids for a healthy coat. It’s a balanced blend of antioxidant-rich fruits & veggies and vitamins & minerals to help support healthy growth and encourage a healthy digestive system. Lamb meal is a high-quality protein source for dogs and it’s the main ingredient in Holistic Select Lamb Natural dog food. This formula doesn’t contain meat by-products, wheat, corn, or soy. Plus, it has a good balance of protein, fat, and carbohydrates. The added Omega 3 fatty acids will provide the nutrients for a shiny coat. 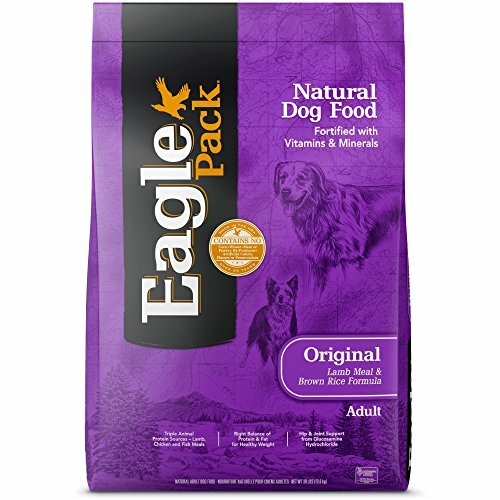 Eagle Pack is a highly rated, well-balanced dog food with no additives. This recipe has a good balance of proteins, fats, and carbohydrates made with lamb meal, oatmeal, and barley. The kibble sizes are small enough for your Pug to eat. Glucosamine is added to help maintain joint health and flaxseed to support skin and coat health. Many pet owners comment that this formula is mild enough for a dog with a sensitive stomach. Plus, this recipe really supports a shiny coat with less itching. Any of the reviewed brands would be a great choice for your Pug. It really depends on your dog’s special needs. Since Pugs are known for their short muzzle, which makes it difficult for them to pick up some kibble. We recommend Royal Canin overall. The best feature of this dry dog food is that the cloverleaf-shaped kibble is specially designed for them in mind. Further, it contains special nutrients to support a pug’s unique skin and joint issues. While it does contain some fillers, it’s still high in protein and appropriately balanced to maintain the ideal body weight of this small dog.